I've had this shot sitting around Aperture (yes, still Aperture) for almost a year now. I took this on my way up to Crater Lake. 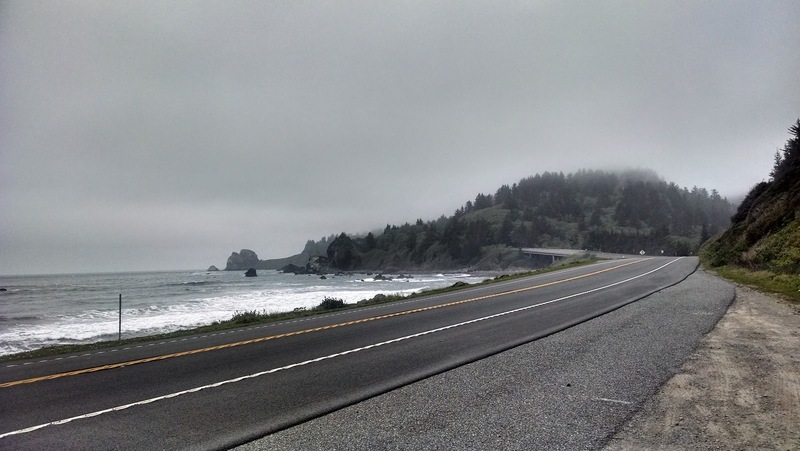 I like the shot, 101 (and yes, only 2 lanes, a far cry from the 4 or more in the Bay Area) literally hugging the coast and going in and out of Redwood forests with the ever present fog found in the area. I sat on this for awhile because I didn't like it as much as a quick, almost accidental snap I took with my Moto X which I ended up liking the composition more. 101 is more prominent in this shot, which is untouched by any kind of editing, except the auto editing Google+ photos does. The lines are stronger here, but the colors are muted. More muted than I remember them being, but also not out of the question for this area of the coast. I like the more prominent coast line in the top shot, which would have cut down on the road in the bottom shot. So between the two maybe there is no "better" shot, just different perspectives. The Moto X shot is an in camera HDR, which I'm not sure on exactly how the camera handles HDR. Not sure if there are actually 3 photos taken, merged, then the source files deleted, or if there is some algorithm that handles a psuedo HDR. The top photo is a single shot, no HDR, but processed through Topaz Labs and Aperture.